One of the off the trails trekking trails is Sarebung Peak that lies at the elevation of 6328m. The 21 days trekking itself passes through in the ancient and medieval village of Lo Mangthang, crossing through the ancient kingdom of Mustang and the mysterious Naar and Phu and taking us through the remote lands, glacier walks and high passes which makes this trip an adventure of a lifetime. Visit the ancient kindom of Mustang and Lo Manthang and the mysterious Naar and Phu. Experience the diverse culture along with the land topography. Early morning we will fly to Jomsom which takes approx. 20 minutes having close views of Annapurna Range, Dhaulagiri and others. Upon landing at the airport, we will meet with our crew members and head out for Kagbeni which is also known as the gateway to the Mustang. It takes about 3 to 4 hrs walk to reach Kagbeni from Jomsom. On reaching the Kagbeni Village, we will complete our paperwork at police check post before entering this long forbidden region of Nepal and spend an overnight at this amazing village full of Tibetan architectural beauty. Today we will head out for Chuksang. The trail passes through the mix of high trail and river bank with the endless stretch of sand to the village of Tangbe (3030m). The village is a labyrinth of narrow alleys, fields of buckwheat and barley and apple orchards with the view of Nilgiri Peak on the back. After 2 hrs hike, we will reach Chuksang village which lies at the confluence of the NarshingKhola (River) and Kali Gandaki River. Passing along the Mustang River and crossing the new bridge we climb towards the village of Chele. Today we will trek passing Chele village. During the walk, you can find a distinct change in topography, culture, lifestyle, and people. From Chele, we will climb a steep spur to Taklam La (3624M) and Dajong La (3660M). After crossing these two passes, we will descend on a pleasant trail to Samar that is protected by poplars. Continuing our walk into the canyon and climbing up and following the train with Nilgiri and Annapurna range in front of us and we make a quiet rise of the tiny hamlet of Ghiling. Today we make a pass towards 3850M and arrive at the amazing village of Ghiling (3570M) following a wall with mani. Ghiling is also considered as the gateway to the Kingdom of Lo. The Chorten and the 15th-century monastery is worth a visit in Ghilling. We will pass Ghiling and trek towards the Nyi La (4010m) to join the second pass at 3510m. We will descend towards Ghemi (3510m), a village that has a distinct feature with the houses that has windows painted in bright colors. We will trek through another small pass before descending down to Dhakmar where we spend our night. After early breakfast, we head out for a long day walk to Lo Mantang. We will pass through Lo Gekar and GharGumba (Monastery) which is one of the major attractions of the day. As we trek further into the valley of Lo through our zigzag trails and reach the first pass of Mui trail. We move further with the sights of goats and yaks grazing peacefully to arrive at a monastery of Ghar Gompa(3920m) that was built in the 8th century. We descent from here and climb gradually to Ghar La. We make a pass at 4280m. Lo Manthang lies at the elevation of 3820m is a capital of the kingdom of Lo. The landscape and the ambiance of the valley create a sense of peace. We spend a rest day to grasp all that the valley of Lo has to offer today visiting monasteries of Chode and Jampa. Other possible hikes today include visiting the Namgyal Gompa and taking a jeep up to the village of Garphu. We trek towards Lo La today that lies at 3945m. A pleasant walk today takes us through the valley that overlooks the canyons with the Annapurna massif and Dhaulagiri at the backdrop. Crossing the elevation at 4073m, we descend to Dhigaon (3390m) and continue for another hour or so following the Puyun Khola to arrive at Yara gaon, a village with small houses and spend an overnight here. Today we will take the trail that stretched mostly upwards taking us to the small settlement at Luri Gompa, which is mentioned by Bodhisattva Padmasambhava who had meditated in the cave which makes this place religiously very important for the Buddhists. After breakfast, we descend towards Luri Gompa crossing the village of Gara. We cross several chorten. Descending further to the gorge that joins the main road from Yara to Ghuma Thati. We will cross a large grassy field at 4780m as we descend towards Ghuma Thanti. Ghuma Thati is a small shelter that is built for pilgrims going to the sacred Damodar Kunda. We trek through the well-marked trail today. We will make a pass of 5320m and we are rewarded with the amazing view of Dhaulagiri (8167m) followed with Annapurna I. We descend steeply down to the Parsye Khola. A short day today to keep us acclimatised. After breakfast, we start our trek going up the gorge for 200 meters and continue following the large slope on the left bank of the river. We pass the elevation of 5490m that provides us with an amazing view of the Dhaulagiri along with Damodar Himal. We continue through the broad valley to reach the sacred lake of Damodar Kunda which is a sacred Hindu lake. We continue towards the Japanese Base Camp following the small paths. The large Chorten built by the Japanese must be the reason this place is called the Japanese Base camp. 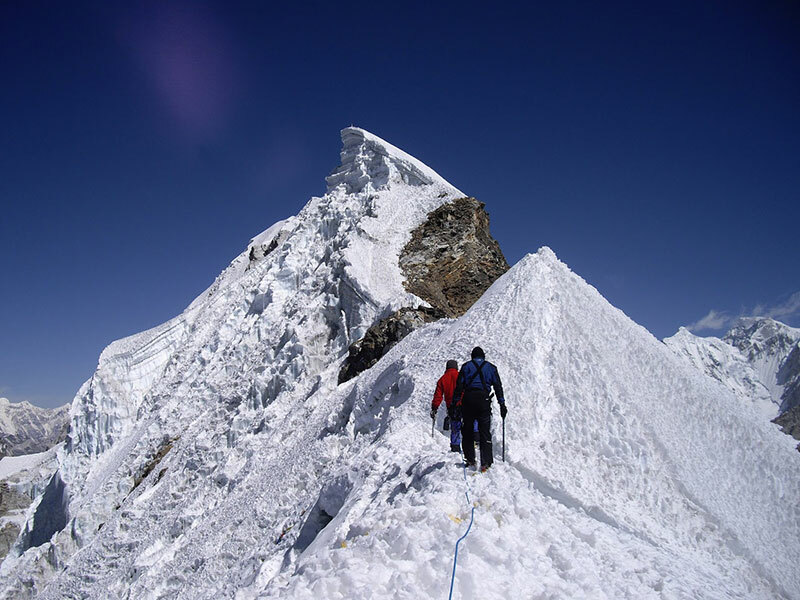 We arrive here and train with our climbing Sherpa to use the climbing equipment. After breakfast, we trek towards the high camp noticing the transition as we ascent towards the moraines of the left bank of the glacier. At around 5700m, we cross the glacier to shift towards the right bank of the glacier where we camp for the night before heading for the last summit push the next day. Today is the final push to the summit of Sarebung peak. The climb towards the pass will take us 3 hours on the moraine and then on the glacier. Another 280 meters of ascending brings us to the summit via easy trails covered with snow. The surrounding views of Gyajiking, Himlung is something that we will remember lifelong. We descend back to the high camp and spend an overnight here. We continue to descend through the hill towards the river from where we start climbing in front on the glacial shoulder and continue up to Ngaru. As we continue we descend through a steep climb of about 200 meters which leads us to a trail to the village of Phu. Phu is a medieval village that is perched on a rocky peak where the Gurung community is found to reside. We take a rest day today to go around the village of Phu. Phu is a village that is built as a settlement of Khampa warriors. Now as a proper village, the old houses are very interesting along with the Tashi Dzong Gompa which is about 20 minutes walk from the village. We continue our trek towards Meta as we descend towards Kyang (3820m). Mostly going down towards the lower elevation, we will cross Chy6ako (3720m) and arrive at Meta where we spend an overnight. Continue descending through pine woods to cross a river through a suspension bridge. We cross the campsite at the Nar Phu river and continue walking towards Koto, a small settlement with Gurung community that adjoins the trail towards Annapurna circuit. After breakfast, we take a bus from Koto to Besishara which is about 4 hours drive through the bumpy road until. From Besisahar we drive back to a long 8 hours drive to arrive in Kathmandu. We are free today in Kathmandu after the strenuous trek and the summit. Evening, we will be transferred to a very nice restaurant “Le Sherpa” for dinner. This tour spends three nights in a hotel in Kathmandu, one night in Pokhara, eleven nights on the trek in lodges (tea houses) and tented camp while on base camp and high camp of Larke. In Kathmandu we normally use a 3-star hotel located within walking distance of the Thamel and in Pokhara we use 3 star hotel located near the lake side.